The education of engineering is reforming the world with their latest and regular advancement and updates in technologies and other resources. At today’s time, India plays a significant role in the technological changes due to the developments at different fields of technologies that includes both industry and academia of the country. The goal of institutes is to produce competent and skilled professional globally through quality technical education so that they can be prepared for immediate employment. For this, Arya college of Engineering and IT has organized a special meeting which leads to the interaction between institute and industry with SAE for the establishment of SAE Jaipur chapter under SAE India of Northern Section. 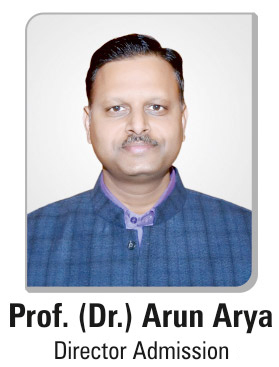 The event was addressed by Mr. Anup Kacker, who is the ED of SAE India at Arya 1st Old Campus on 18th January, 2018. The Engineering Society for Advancing Mobility was the part of the meeting which usually covers Land, Sea, Air and Space. Most of the engineering industries and institutions are completely interdependent on each other for the new discoveries and inventions so that engineering aspirants can meet the demands of the current problems of the society. These type of interactions leads to more innovations and inventions, as it is known as the India’s leading resource for mobility technology. SAE INDIA is an affiliate society of SAE International registered in India as an Indian nonprofit engineering and scientific society dedicated to the advancement of mobility industry in India. It includes advancement, designing and development of all kinds of automobiles or vehicles. This program focused on uniting scientific and technical staff so that they can perform free academic discussions, dedicates themselves to the cause of prospering technology and science for automotive vehicles. It also made contributions to increase the modernization of automotive industry which further creates healthy environment in the country as well as individual’s life.